Fashiowl Poses – Close up on me ! Head Skin Applier : COLIVATI BEAUTY – Aiysha – Tone 4 (GENUS) c. By Colivati NEW!!! Skin Applier : COLIVATI BEAUTY – MAITREYA Body Appliers tone 4. By Colivati NEW BODY APPLIERS 2019!!!! Eyes Applier : EUPHORIC – Becky Eyes Collection ~[Genus] . Eyeshadow : EUPHORIC – Candy Glitter Eyeshadow applier RARE [Genus]. Lipstick : EUPHORIC – Candy lipgloss # 7 common gacha [Genus]. 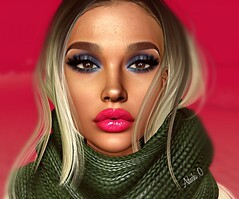 Mesh Head : LELUTKA– Greer BENTO Mesh Head. vers. 3.0 .By jadenart + GREER Eyebrows Shape (default in the package). Head Skin Applier : COLIVATI BEAUTY – Dona – Tone 5 (Lelutka) ♥. By Colivati NEW!!! Choker : LE FILL CASSE’ – Everly Lace Collar – Black ( RARE GACHA!!). Head Skin Applier : COLIVATI BEAUTY – Sayo – Tone 5 (Lelutka) ♥. By Colivati NEW!!! Sweater & Dress : BLUEBERRY – Laura – Cropped Sweater and Corset Dress – Fatpack . By Blueberryx NEW!!! Head Skin Applier : COLIVATI BEAUTY – Kristi – Tone 5 (Lelutka) ♥. By Colivati NEW!!! Head Skin Applier : COLIVATI BEAUTY – Natasha – Tone 5 (Lelutka) ♥. By Colivati NEW!!! Eyeshadow : COLIVATI BEAUTY – Eyeshadow Diva Set . By Colivati JANUARY 2018 POWDER PACK LELUTKA!! Eyelashes : COLIVATI BEAUTY – Diva Charme Lashes. By Colivati JANUARY 2018 POWDER PACK LELUTKA! !